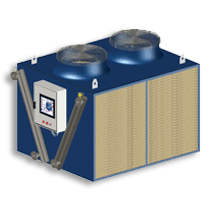 When it comes to heat transfer and more specifically, cooling water, the most efficient way is through the process of evaporative cooling. This is a method of cooling that has been used by humans for thousands of years, as far back as the ancient Egyptians and Persians; who used wind shafts on their roofs to catch the wind and pass it over subterranean water. This cooled air would then be discharged into buildings, providing the origins of comfort cooling. Today, evaporative cooling adopts exactly the same principles but uses technological advancements in materials and design to further improve this efficient method of cooling. This article focuses on cooling towers and more specifically, open circuit cooling towers and the importance of the heat transfer layer of cooling tower packing. 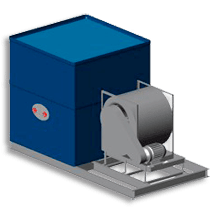 What is an Open Circuit Cooling Tower? An open circuit cooling tower can be defined as a cooling tower there there is no separation in the cooling loop through the process flow. 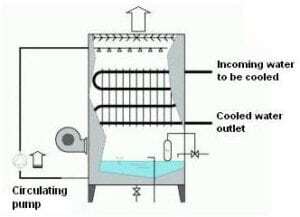 The cooled water flows through the process and returns to the cooling tower, heated by the process, ready to be cooled again through evaporative cooling. In Comparison, a closed circuit cooling tower has a primary and secondary circuit. This separates the cooling circuit from the process loop. Water is circulated over a coil within the tower, which through input from the fan delivers evaporative cooling to the process loop, which in turn, returns cool water to the application. It should be noted that it is possible to have an open circuit tower (with heat transfer pack) but create a closed circuit through the introduction of a heat exchanger, which achieves separation of the process side and cooling side of the system. What is the Purpose of the Cooling Tower Packing? Cooling tower packing, also referred to as heat transfer pack or fill pack provides a large surface area for evaporative cooling to take place. It is located beneath the water distribution layer and above the sump of the cooling tower. Depending on the design of the tower, air is either pushed through (forced draft) or drawn through, (induced draft) the packing layer. As the air passes over the film of water, evaporative cooling takes place and the water is cooled. Are there Different Types of Pack? Packing comes in all shapes and sizes and it is important to know when and where to use each type. 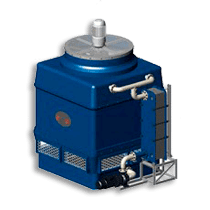 This is of particular importance when it comes to replacing the packing, which will be inevitable over the typical life of any cooling tower. Historically, cooling tower packing was constructed using wood, either in a grid / splash pack formation or layers of off-set lathes. Today, plastic in the form of either polyurethane (PP) or Polyvinyl Chloride (PVC) is the most commonly used material for packing. Plastic packing has brought many advantages, but most notable is its efficiency. Reducing the required size of a cooling tower by typically 2/3rds. It is also lightweight, making it easier to handle and therefore encourages replacement and regular removal for cleaning. Cleaning of wooden packs were typically done in situ. PP and PVC packing is also highly resistant to erosion, has a self supporting structure through the high number of connecting points and delivers a long service life due to the inherent qualities of PVC and PP being resistant to UV, chemical and bacterial damage. 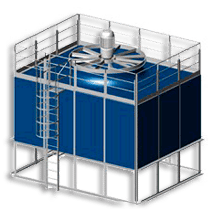 Cooling Tower packing is either constructed in modular blocks or sheets or stackable PP grids in the form of Spalsh packs. Modular blocks of packing can be assembled in a variety of ways. These include, welding or gluing sheets together or using rods or baskets to hold sheets in place to form a block. 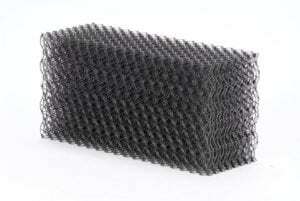 Welded sheets are considered the strongest and most environmentally friendly method of creating modular packing. Packs constructed using rods typically lose their shape over time and change from a cube to a parallelogram shape creating inefficiencies in the packing. In basket held pack, the baskets are often plastic coated wire, which over time degrades, exposing the wire which causes corrosion in the tower. Sheet packing is installed using hangars. Although theoretically easy to separate and clean. This is often not the case and requires replacement of the fouled pack. 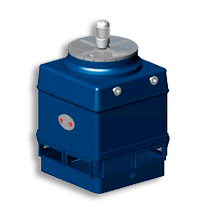 The process and the tower design are the most important factors when considering the type of packing to use. The process determines the water quality and temperature. In areas of fouled water it is important to ensure that the packing does not clog up and reduce its performance. 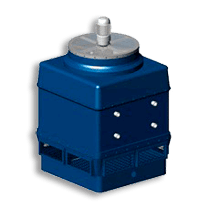 For slightly and medium polluted water, vertical flow, or offset / vertial flow or larger cross fluted options are available. For heavily polluted water, grid or diagonal splash pack should be used. There are also larger cross fluted options if required. 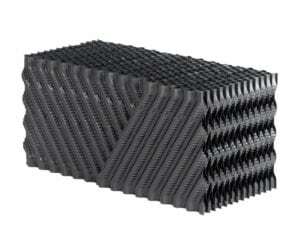 The openings within cooling tower packs are commonly referred to as flutes. These come in various sizes, typically ranging from 12mm to 38mm. The smaller the flute size, the larger the surface area per m2 therefore the larger the film of water, creating a higher potential heat rejection per m2. 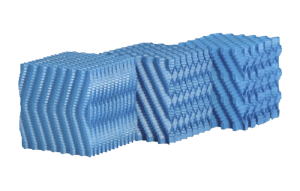 In cross fluted packing, the flutes are arranged diagonally opposite each other to further increase the total surface area. In vertical fills, as the name suggests, the flutes are arranged vertically. This allows for easier flow of more polluted water. Water Temperature – Where the return water temperature is high, typically in excess of 80oC, there are special high temperature packs available. These should always be specified where this is the case as packing not suited to these high temperatures can melt and lose its integrity. 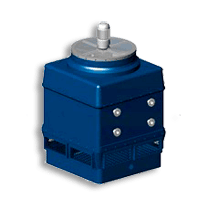 Tower Design – The type of packing used must be suitable for the type of tower. For example, cross flow cooling towers require cross flow packing and likewise, couterflow cooling towers require packing designed for either forced draft or induced draft cooling towers. Using the incorrect packing can seriously hamper system performance and cause overflow issues if water is directed through the pack in the wrong direction. Understanding the duty of the cooling tower is important when considering the packing. The design duty would have been specified based on the original pack. If the pack is changed out then it’s important to ensure that the replacement pack at least meets this original duty. Of course, it is possible to increase the performance of the cooling tower by specifying a smaller flute size and to the in turn, decrease performance by using a larger flute size. 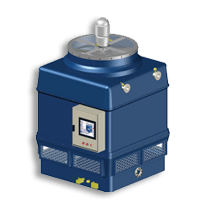 In some instances, it is also possible to increase the depth of packing therefore further increasing the system performance. Contrary to popular belief, swapping out OEM cooling tower packing with a generic pack will not necessarily reduce system performance. 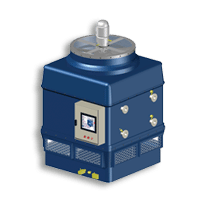 As long as the replacement packing delivers the same level of heat transfer and is suitable for the design of tower then it is perfectly acceptable, and in some instances advantageous to replace OEM packing with a generic variant. Why would I need this if I have a robust water treatment regime? 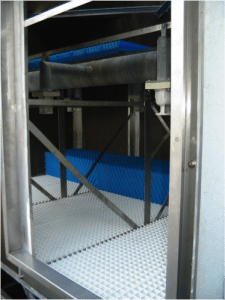 Although cooling tower water must be treated to minimise the risk of harmful bacteria including legionella, there are always areas of the packing that are in a wet / dry state. This has the potential to occur in all towers irrespective of the quality of the water distribution. Anti-Legionella packing, often blue in colour, is impregnated with a non-leaching biocide that lasts for the lifetime of the packing, and provides additional protection against bacteria. It should be noted that the same biocide is available in drift eliminator materials and even GRP cooling tower casings. 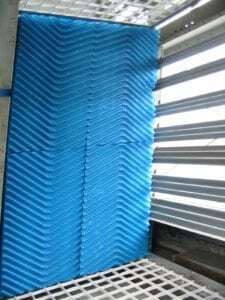 By no means does this type of packing replace the need for water treatment but rather provides additional protection in areas that are not reached by the water treatment. Ensuring the performance of the cooling tower packing is critical to the overall performance of the cooling tower. Fouled pack also presents an ideal breeding ground for harmful bacteria. Pack should be regularly inspected through either removal or by way of a borroscope inspection, to check for scaling and fouling levels. Refer to HSG274 Part 1 for specific cleaning requirements suitable for your system design and process. Installing modular packing, that can easily be removed, makes cleaning and future replacement far easier. 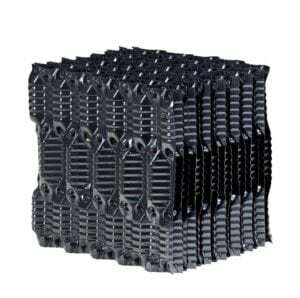 Modular packing can be installed in any cooling tower, irrespective of the OEM packing. For example, some crossflow cooling towers have sheets of packing on hangars that is difficult to remove and reinstall after cleaning. 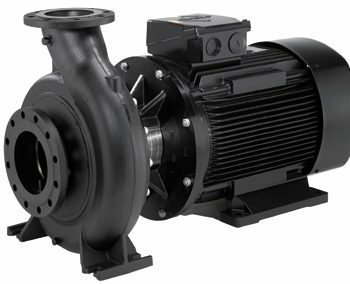 Light weight, cross flow, modular packing will not only maintain the system performance but improve the maintenance regime through being easy to remove, clean and replace as required. Cooling tower packing will ultimately require replacement. Overtime, it may become too fouled to clean or brittle through chemical and UV damage as well as cleaning over a sustained period. Packing can also become damaged through the removal process and by being trod on. As discussed earlier, ensure the replacement packing is suitable for the cooling tower and will deliver the required heat transfer. If the packing has already been replaced in the past it is worth checking with a specialist to ensure that the new pack going in is suitable as opposed to simply assuming a like for like replacement is required. Changing out the packing also provides the opportunity to look at more efficient packing if required or an open mesh pack if the water is particularly fouled. A heavily fouled, narrow fluted pack will be far less efficient than a splash, grid or larger fluted pack that is not fouled. When the packing is removed, it also provides an excellent opportunity to install a permanent safe clean platform. 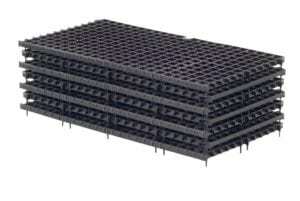 This is a permanent GRP open mesh grid that is installed beneath the bottom layer of the packing. Not only does this allow operatives to work safely at heights, in accordance with the Working at Heights Directive, but also provides improved support for the pack through distributing its weight evenly across the tower. This in turn extends the life of the pack. The heat transfer surface of any cooling tower is critical to its performance. 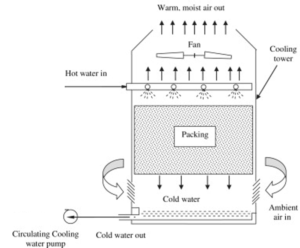 In the case of an open circuit cooling tower the heat transfer surface is the cooling tower packing. It is important to select the most suitable cooling tower pack when replacing to at least maintain the design duty of the cooling tower. 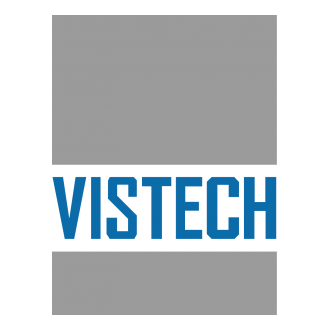 The water quality, water temperature and cooling tower design dictate which pack to select as well as considerations for removal and maintenance. Using an anti-legionella packing material provides additional protection in areas of the cooling tower that water treatment doesn’t reach but is not a replacement for an appropriate water treatment regime. If it isn’t clear that the existing packing is the original pack then it is prudent to seek specialist advice to ensure that the replacement pack will deliver the appropriate levels of heat rejection. This should also be the case when looking to improve the performance of the cooling tower.